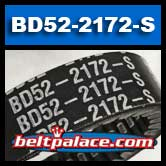 Home > CVTech - ASW CVT Drive Belts > CVTech BD52-2172-S Drive Belt. Genuine CVTech Brand BD52-2172-S OEM Drive Belt. Proprietary drive belt for CVTech Variable Transmission Clutches. *Clearance priced while supplies last. ONLY TWO LEFT IN STOCK. ORDER NOW!